I picked this picture because it makes me look authoritative and important. Also it is nicely advertises my school. 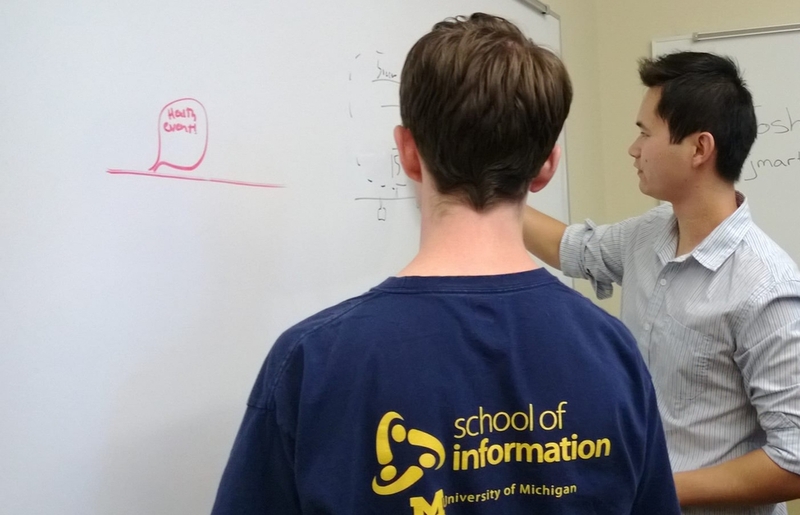 SOCHI is the Student Organization for Computer-Human Organization, and is the major HCI organization at Michigan. We are an official member of ACM SIGCHI and a big part of the HCI community here in the Midwest. One of the big things we do is host design jams. Design jams are events where we bring in companies to present a design challenge for our students to solve within a few hours. We've had companies as diverse as Ford, Facebook, TechSmith, Mozilla, and Humana in the past. The goal is to give students a chance to practice all the skills they've learned in class. Sometimes students don't have a lot they can put in their portfolio. Design jams give them a chance to show their design process and their creativity. Plus, they're lots of fun. Companies also get a lot of benefit. Design jams can be recruiting events. They can also be a great way for lesser-known companies to get their name out and show their commitment to UX. Also, sometimes organizations have tricky problems and are having tough times finding solutions. Our students are taught to approach problems with creativity and empathy. It's so rewarding to hear "wow, we never thought of that!" Many companies come back year after year. Google is one of them. This year, Google's design jam was all about Google Wallet. "How can we increase awareness of the Wallet brand? Design the experience." The winning proposal was to have a Youtube 'like' automatically donate a small amount of money to the content creator via Wallet. My team went with the Google X off-the-wall approach, envisioning Google Wallet seamlessly integrated with Google Now, Google Glass, and the yet to be announced Google Rocket delivery system (perhaps it should be noted that several members of my team including myself are in a ubicomp class called Pervasive Interaction Design). I'm pleased to announce an upcoming design jam with Shure. Shure makes some awesome audio equipment. I have two pairs of their headphones, and I wouldn't hesitate to get another one when the time comes. Naturally, I was very excited when I learned that Shure was interested in a design jam. I'll update this post when we announce the design challenges, but they're going to be really fun. This will be the first all-day design jam. The extended time is so students can go through the whole design process and present the best idea they have, not just the best they could come up with in an hour or two. We're also inviting Human Factors and Ergonomics students to join, as the design challenges will combine UX design, interaction design, and product/industrial design. I worked with Shure to scope the design challenges and set up the event, so I'm really looking forward to this. In scoping design challenges and planning for design jams, I have to create a great experience for my classmates. I have to make them fun yet challenging, making use of their built-up skills, while pushing them to apply concepts they may have just learned. It's interesting that I like event planning so much. (I also run World IA Day in Ann Arbor, and am busy making sure that 2014 will be awesome.) I think it's the same reason that I was drawn to study HCI and pursue UX work. Whether a product or an event, digital or real life, great people and great companies create delightful experiences for users. When your users can focus on activities, rather than the task of using your product to do that activity, you've succeeded. They feel good. You feel good. It's so good.